Alternate history buff? 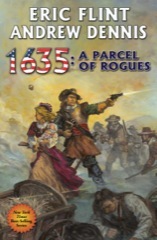 Wander on over for a discussion about Eric Flint's 1632 series! Hutch wrote: And the E-ARC for Commander Cantrell is now available from the Baen website (just acquired it Monday night). I liked the book but not the cover art... The ship should be lower in the water... with that much freeboard its a wonder it did not keel over. I do not understand why the cover art is so wrong. Anybody ever do a critic before they went to press? Anybody? Or put more gently...even I could have done much better with all the book covers and I am not even remotely an artist. The dead bad guy in the alley with the good guy standing over him with the uptime pistol is done wrong. Tactically stupid. The observation car from the airship is wrong. Wrong shape. Wrong rigging. No comm line observable. Just me? That steam sailing ship is a joke. It would just capsize. Hull wrong for era. Stack wrong. Guns wrong. Speedboat OK. Besides everything being wrong with cover art, I am now looking very forward to reading all this new stuff. Hot dogs! HB of CJ (old coot) Lt.Cm. Sorry for rant. Errors like this are easily correctable, but were not. Why? Well 1636: The Viennese Waltz was released in November 2014. 1636: The Cardinal Virtues due out in July 2015.
fallsfromtrees wrote: Well 1636: The Viennese Waltz was released in November 2014. I'll paperback the GG (member of the site), but I am looking forward to the Cardinal Virtues; just hope it doesn't disappoint. It is true that most of the characters in Viennese Waltz are from the Sewing Circle series of stories, and are not that interesting, unless you liked that series of stories. What is more interesting is the background being laid for the eventual war between Austria and the Ottoman Empire. CPO Poker Mind and, Mangy Fur the Smart Alick Spacecat. "Better to be hung for a hexapuma than a housecat," Com. Pang Yau-pau, ART.